Seeing as how I’m about half a dozen figures behind in reviews, I decided it was time to stop being lazy and post pretty pictures. 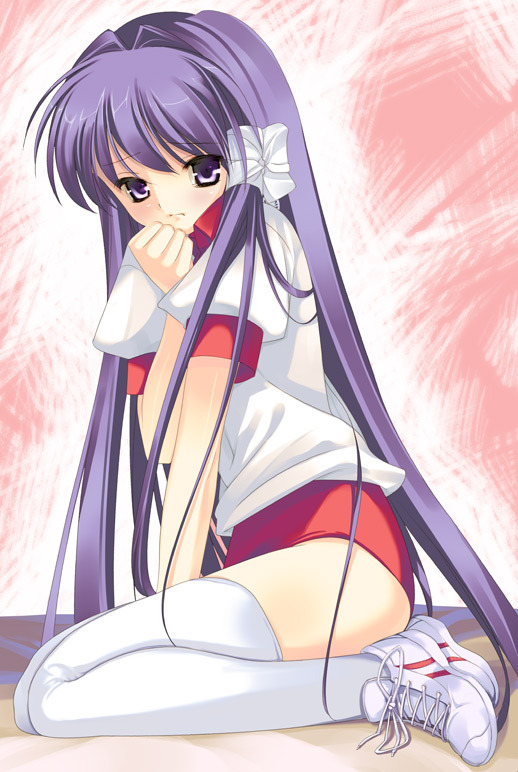 This time ’round it’s Fijibayashi Kyou from the popular visual novel and hit anime series Clannad. Did anyone else watch it? 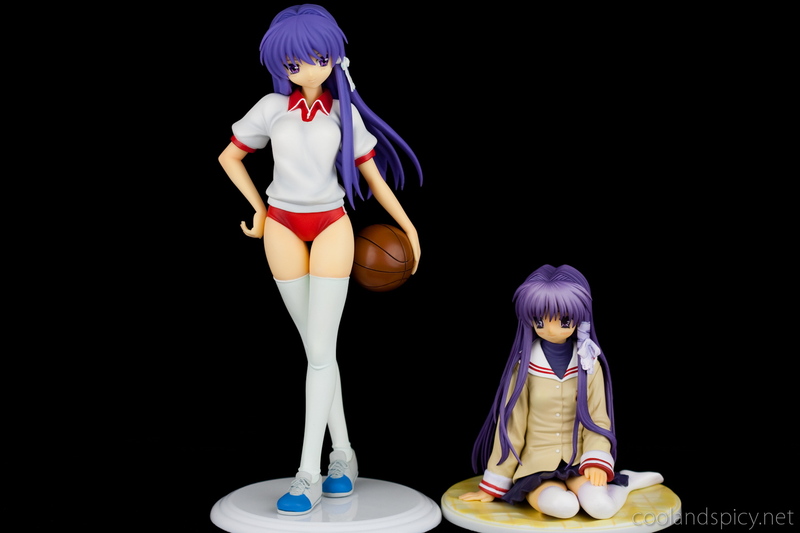 ;) Kyou is one of my all time favorite characters so I couldn’t help but to pick her up last August. At 1/7 scale, this Kyou figure is slightly larger the 1/8 scale that most figures come, but the size difference is barely noticeable and I would probably easily mistake it for 1/8 if I didn’t know the actual scale. Kyou carries the basketball from practice. It’s perhaps a bit too shiny/smooth. Anyway, do you like this photo? 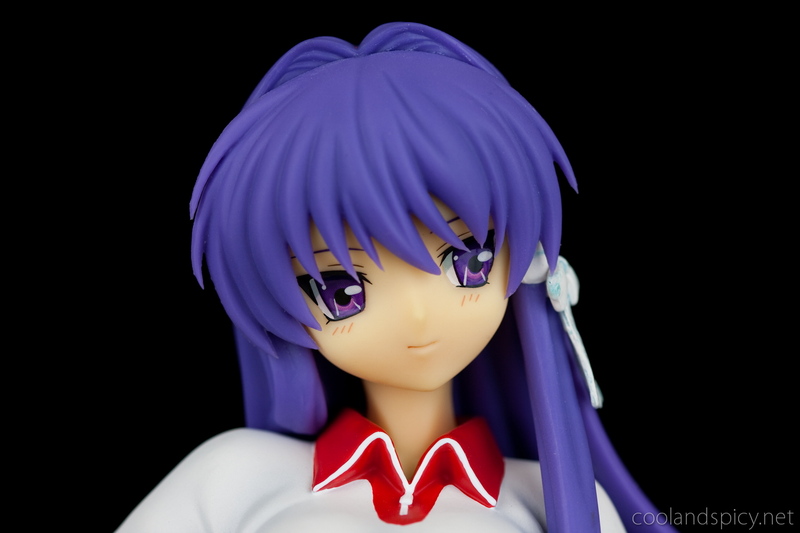 One of my main gripes with this figure is Kyou’s hair. It’s a bit clumpy and simplistic but beyond that it had rough molding. Some of the edges and corners weren’t cleanly cut and had small fragments loose. From normal viewing distance, this is not really apparent but with these macro shots, it can be seen (in this photo in particular). I do like the figure’s pose. 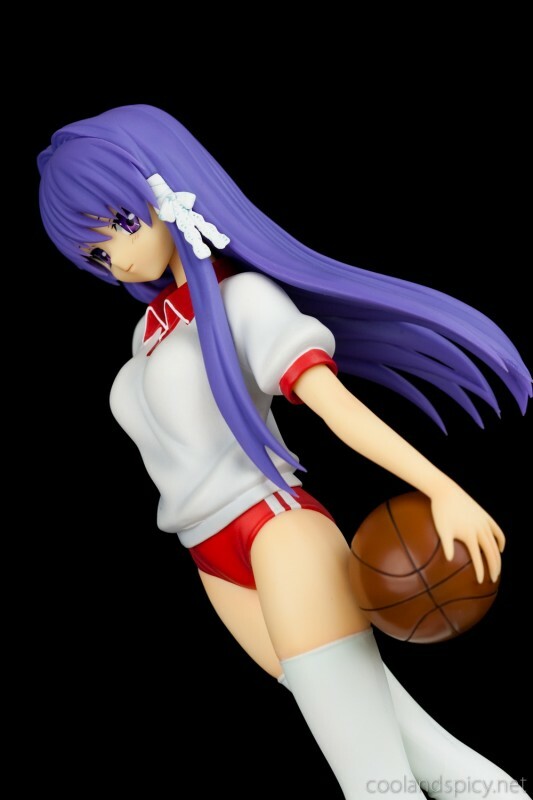 Kyou is in her gym uniform, basketball in hand, seemingly in the middle of practice. It’s quite fitting that she has a look of confidence on her face and her pose is with her in a self-assured mid-step forward. Seems like an accurate reflection of her strong-willed, athletic personality. Another review for Kyou over at Tentacle Armada. .-= mefloraine´s last post… The Meaning of Art =-. Yeah, but I think the ball is a bit too small for them to have put bumps on the it like the real deal. That’s a cute figure of Kyou, she was one of my favorite Clannad girls next to Tomoyo. .-= Smithy´s last post… The Ace of ace is here =-. Tomoyo is also getting a figure done by Wave, but she is in her normal school uniform. Doesn’t interest me quite as much but I’m still thinking about getting her. .-= Leonia´s last post… Bungaku Shoujo – Kyou no Oyatsu – Hatsukoi =-. 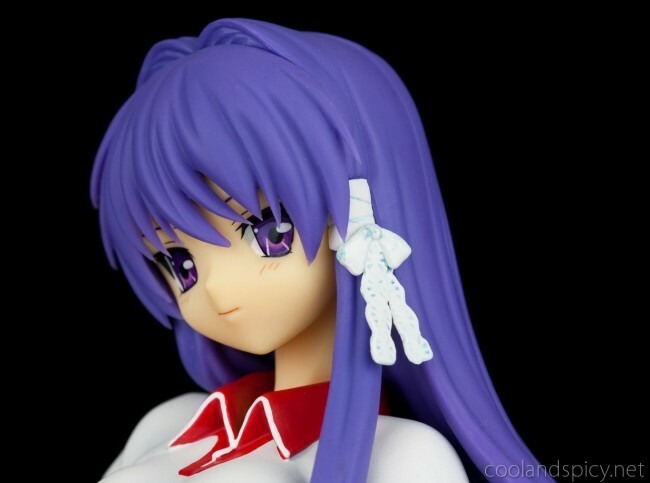 Wow this has to be the first Clannad figure and girl where I am not running away screaming because of their weird faces and especially eyes. 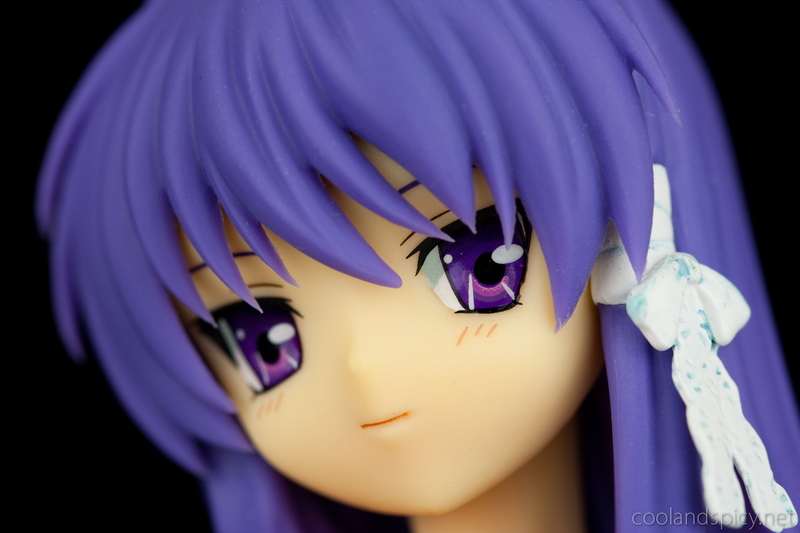 I prefer http://coolandspicy.net/wp-content/uploads/2010/02/wave-kyou-6.jpg . Infinitely. And yes, the ball does seem too smooth… If you played with that it would slip all over the place ^^; But otherwise it looks like a good figure. At least from the photos, the flaws you talked about aren’t obvious.